Trans-trax: Luton - The Next Best Bet ? Luton - The Next Best Bet ? The new coalition government has stated that it is not going to permit the building of a third runway at Heathrow airport nor second runways at Gatwick and Stansted airports.This is despite the fact that as long ago as 2003 it was recognised in the report "The Future of Air Transport " (16-12-03) that "two new runways will be needed in the South East over the next three decades." The government, however, is offering us none, or is it? A brief comment should be made on why the announcement was made and in the terms used. The 2010 election was the one to be won at all costs by the Conservative Party. They had been out of power for 13 years and were desperate to regain it. The decision had already been made to cancel the third runway at Heathrow just because Labour supported it and it was a vote winner. The LibDem. attitude only reinforced the argument and so the coalition did not think twice about it - at least for the next 5 years(!!). Gatwick and Stansted were added to the list to satisfy the LibDems. though the decision certainly benefited the Tories since the two airports are in highly affluent True Blue country. Cost was not a reason at all because the runways would be privately financed. Noise and exhaust pollution were pushed as reasons but those are smoke screens. Reality would be different with stricter regulation and newer engine efficient aircraft being imposed as the only operable vehicles. The nimbys have won the day without even starting the battle - for a comparison the reactions started over HSR2 have been in True Blue Chiltern country. Thus go back to basics and fight one battle at a time. "Luton/Dunstable is identified in Regional Planning Guidance as a Priority Area for Economic Regeneration and, along with Bedford, is designated as a Growth Area in the Communities Plan. The continued expansion of Luton Airport has the potential to play a key role in delivering employment-led growth in this area." What better for the government than to show it is creating employment. Thus we come to the conclusion that Luton airport is going to be the solution of the runway needs for South East England. However, political considerations are not the only factors. Even though the report indicates that Luton was the last and least likely option for expansion, in the new circumstances other reasons come into play which make Luton much more attractive as an airport for expansion than any of the others. 1)- As we have already indicated Luton is an area ripe for development, especially since the decline of the auto industry. 2)-There is an already electrified line from Bedford through Luton Parkway into central London and south to Brighton offering excellent connections both north and south of the Thames for a large number of potential clients. 3)-First Captial Connect trains run from Bedford through Luton to St.Pancras(for the services to Paris and Brussels) and south to Gatwick airport and Brighton. 4)-East Midland trains run services from St. Pancras through Luton to Leicester, East Midlands airport, Derby, Nottingham, Sheffield and onwards to Leeds. 5)-Road access to the M1 is literally "on the doorstep". 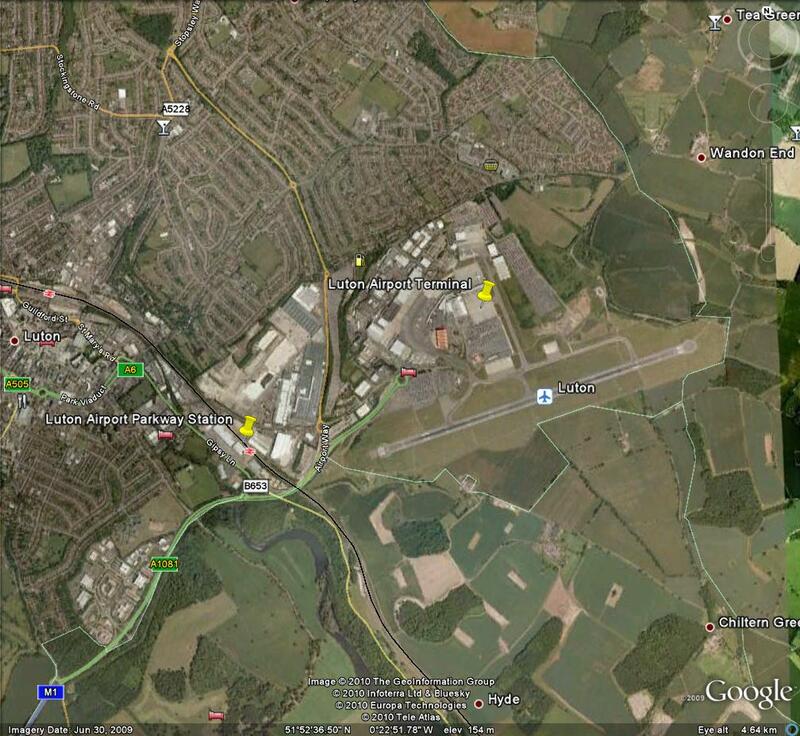 6)-Road access to the A1(M)would need the construction of a new road link to Stevenage. (about 11kms. away in a direct line). The connections are, therefore, much better than any other London airport - to both Gatwick and East Midlands. The access to the airport is good or very good for a large proportion of the Midland and Yorkshire population without having to pass through Central London. 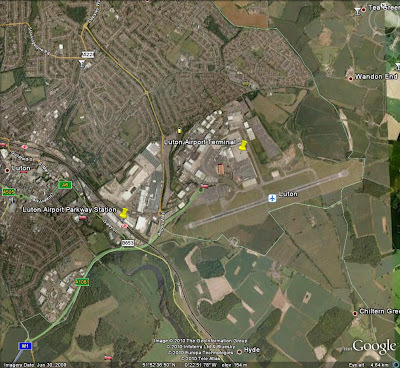 As can be seen from the Google map the runway alinement is WSW-ENE. In the airport´s plans, as published in the said report in 2003, the idea was to either extend the present runway or move it a little southwards and use the present one as a taxiway.Thus increasing the capacity for take-offs and landings. The development plans published on the airport´s website at present indicate a date of September 2001 which co-incides with the government´s original plans in 2003 to give the airport a minor role in London´s air traffic. However, it should be said that these plans replaced a much more ambitious plan to develop the airport with two runways (Published in October 2005 and withdrawn in July 2007). However, if the only alternative for the increase in demand in air in South East England is to develop Luton then the old plans should be dusted off and looked at again. The effects of such a change in policy would go into other areas. that with new improved lines from East Midlands airport to Derby-Stoke-Manchester, and to Nottingham-Sheffield-Leeds the service to the Midland cities and those on both sides of the Pennines could provide an excellent frequent and competitive (alternative) service to London and much more accessible to a major airport which Luton could become (and all without threatening to throttle London). Part of the problems of the WCML and ECML are the bottlenecks where the lines are not four-tracked(at least) and the lines become clogged with mixtures of long distance, regional and local passenger traffic with freight all vying for access. With an electrified MML, as we indicate in the aforementioned Fast Track 3, upgrading the MML and being able to put on fast trains to Derby, Stoke and Manchester on one hand , while to Nottingham, Sheffield and Leeds on the other, would aleviate capacity on both the WCML and ECML, provide competition and give direct acces to potential clients in the East Midlands, the North West and South and West Yorkshire to Luton airport - all at a lower cost and greater benefit for a greater number than the proposed HSR2 (which will not go anywhere near an airport except Birmingham International). Is it not time to think of these alternatives and put them into practice? We must finish by saying, as we did in Runways in South East England (24-3-10), that we support all the main four London´s airports wishes to increase runway capacity - including a third runway for Heathrow - as we argue in that blog. And we are not alone.